There was late, late drama at Oriel Park last night as Patrick Hoban's 95th-minute penalty snatched Dundalk a victory that they really didn't deserve against Bohemians. As the game hurtled into the last seconds of injury time, the Bohs supporters who braved the teeming rain were making all the noise after watching their side's impressive display. That all changed when Sean Gannon was upended by Paddy Kirk and Hoban accepted the chance to send James Talbot the wrong way from 12 yards. It was a bitter pill for the visitors to swallow. 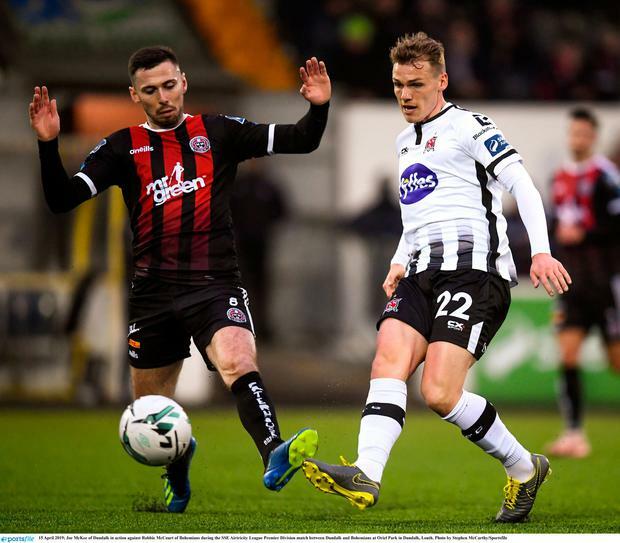 Despite making seven changes to the team that beat Finn Harps on Friday night, Bohs were much better in every department against a Dundalk side that came into the game on the back of two straight defeats. Starting the game 13 points behind leaders Shamrock Rovers, this was a chance for Vinny Perth's side to make up some ground and the celebration that followed Hoban's penalty was an indication of how important this goal could prove to be. The natives almost found themselves behind after just four minutes. Keith Buckley was afforded space to pick out Danny Madriou but he couldn’t keep his header on target. The visitors knocked the ball around with zip and confidence and they passed up another gilt edged chance to go in front with 35 minutes played. Sean Hoare’s slip allowed Ali Reghba to take possession on the right of the Dundalk penalty atria. His cross located Kevin Devaney but he could only stab his close-range effort into the side netting. Gary Rogers had to tip a Ryan Swan effort behind on the hour mark after an incisive run by Mandriou had the Dundalk back four back peddling with Rob Cornwall flashing a header just over from the corner that followed. Things became stretched in the the final 15 minutes and Dundalk were let off the hook again when Shields coughed up possession to Mandriou but the youngster couldn't pick a pass to release Swan. It looked like the only winners on the night would be Rovers but Oriel Park erupted when Hoban dispatched his effort from 12 yards to settle a pulsating affair. DUNDALK: Rogers; Gannon, Hoare, Cleary; McKee (Shields 56), Flores (McEleney 59); Mountney (D Kelly 73), McGrath, Duffy, Jarvis; Hoban. BOHEMIANS: Talbot; Lyons, Barry, Cornwall, Kirk; McCourt, Buckley; Reghba (Grant 74), Mandriou (Allerdice 90), Devaney; Swan (Byrne 86).